Please see individual varieties for specific product information, but in general the growing information will be the same for all strawberries. The majority of the information on this page was provided by the University of Arkansas Cooperative Extension Service Strawberry Production in the Home Garden Series; download the complete pdf file with FAQ’s for more information or click here to visit the website. 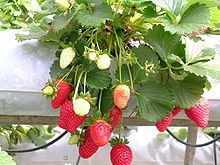 When To Plant: Set out strawberry plants in late winter or early spring. Around the end of February or early March. Check an almanac and see when the average date is for the last frost in the spring and set out your plants 3 or 4 weeks before that. Planting Tip: Strawberries do not like to be crowded so space them accordingly. When planted make sure that you plant them deep enough but not so deep that the crown is covered. This will cause the plant to rot or grow slowly. Spread the roots out and carefully pack the dirt around them so that there are no air pockets which will cause them to dry out. If the soil is dry when planted, irrigate as soon as possible. Average Yield: Depending on the variety, strawberries can produce 15 to 25 pounds of berries per 50 feet. The weight of a quart of strawberries is about 1 1/2 pounds per quart. Preparation and Care: Choose an area that is easily irrigated and drains well to plant your strawberry crop. You can have your soil tested at your local extension office to determine how to best prepare your area for planting. Begin preparing your soil in the fall before you plant in the spring by working in the proper amount of lime. Be sure to work the soil early enough that is has time to settle before planting. While plowing, watch for white grubs. If there are a considerable amount, treat the area with the proper insecticide before planting. If possible plant strawberries in a high area so that cold air can drain down to a lower level and hopefully prevent frost from killing the early blooms. Cultivate the rows to keep the weeds down at least every two weeks. You can mulch strawberry plants with hay, straw or pine needles to keep down the weeds. Doing this after the first frost in the fall will help protect them from later frosts and cold weather. In the spring, rake about half of the mulch out into the rows. The remaining mulch will help to keep the berries clean. Watering: Water your garden (cantaloupes and everything else) once a week with a 8-12 hour soaking. This will allow the soil to absorb an adequate amount of water and also limit the time you spend each week watering. If you use a sprinkler to water, do this during the day so that the plants will have some time in the evening to dry out before dark. This will limit the chances of disease. If you use a soaker hose, you can water at night. Watering with a soaker hose at night is best as it limits the amount of water lost to evaporation and keeps the plants dry which limits the chances of disease. During dry periods you may need to water more often (every 4-5 days), and watering at night is important in water conservation during droughts. Fertilize: If your soil test shows your soil to be in good condition for strawberries, then you may not need to fertilize. If you have a new area or the soil analysis indicates a need, use 10-10-10 or 10-6-4 at around 1 pound per 100 feet of row. Do the same in early fall and around January or early February but not on into the spring. Fertilizing in the spring can cause excess growth of vegetation which will cause low yields, increased rot, late ripening and poor fruit quality. Harvesting: Picking strawberries when they are the reddest ensures the best sugar content and flavor. Harvest by the stem to prevent bruising and be sure to harvest all of the ripe berries because they will not keep. Pick every day or every other day. Culture Problems: Small berries can be caused by crowding. Keeping plants spaced to about 6 inches and supplemental irrigation will help ensure large beautiful berries. Birds-Though birds aren’t insects, they can still be pests where strawberries are concerned. You may need to place netting over the plants to protect them. Common Disease Problems: There are a number of plant and fruit diseases that can damage strawberries. Click here to go to just one of many sites that can help you identify and hopefully correct the problem.